How can you pledge your #TealLove to someone with food allergies on Valentine's Day? Encourage others to share non-food gifts which are safer and more inclusive for everyone. Share this image. Download our Tips to Safely Celebrate Valentine's Day With Food Allergies which includes ideas for celebrating both at home and at school. If you choose to include food in your Valentine's Day celebration, find safe recipes and ideas. Be sure to read all labels carefully. Many candies look alike but can have different ingredients and advisory warnings. Caitlin Reiter, of Caity's Kitchen: Thriving With Food Allergies, shares her tips to celebrate L-O-V-E on Valentine’s Day. Learn more about managing food allergies. KFA's free online Managing Your Child's Food Allergies course will help you understand the basics of managing your child's newly diagnosed food allergy while keeping them safe. Recommend this course to grandparents or other caregivers as the perfect gift for your child. 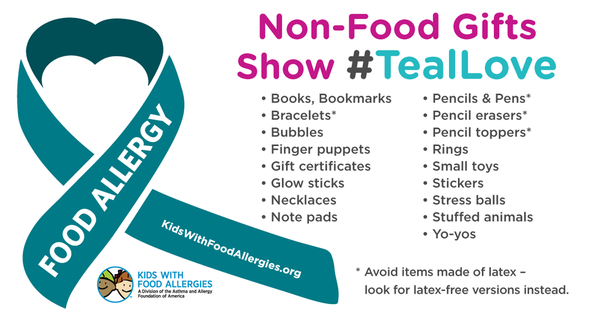 Pledge your #TealLove by donating in honor of a child with a food allergy. When you send a gift to Kids With Food Allergies, every donation helps our efforts to raise awareness about life-threatening food allergies and keep children safe and healthy.